The moral vacuum of dreams is discomfiting. I’m wandering backcountry Pennsylvania roads, somehow back in college, and I’m outdoors with my indoor cat. I’m distracted, knowing I’ve missed class again. Naturally. When a car hits my cat, I catch the driver on foot and punch him until he loses consciousness. What in the hell is this awful crap? I’ve shirked my responsibilities as a pet owner, student, and pacifist. The dream version of myself just rolls with it, though. Dreams have no moral stakes, and we’re at their mercy. The Legend Of Zelda’s stock in trade is moral certitude. Link saves the princess by slicing a pig monster right in his blue dome. He sails a boat into the center of the ocean and stops darkness from covering the land. But Link’s Awakening is not so black-and-white. Link doesn’t save the world at the end of his 1993 Game Boy misadventure. He simply wakes up, a dreamer troubled by nightmares, and like any figure from a dream—whether they’re just some Jungian archetype or just so much mental debris—it’s not clear he’s doing the right thing. Because it calls Link’s will into question, because it’s tinged with uncertainty, and because it captures the illogical flow of a dream, Link’s Awakening feels more human than other Zelda games. Like the best midnight-snack-fueled freakout dreams, Link’s Awakening eases into its Morphean strangeness. In contrast to the more forthrightly surreal and sinister Majora’s Mask, Awakening feels familiar but slightly askew when Link starts adventuring. Our hero is bored with the usual golden triangle scavenger hunts back in Hyrule, so he takes to the high seas. A thunderous squall tosses his boat, and Link is shipwrecked. When he wakes up on Koholint, a verdant island, there’s no grand call to adventure at first. A woman named Marin has rescued Link from the beach with nothing on him but his clothes and a shield. Her father says that a sword washed up on the beach as well, but some dangerous creatures were nearby, so Link will have to go pick it up himself. Getting your quest wares together is standard operating procedure for Zelda. Even in Koholint’s unusual climes, Link’s day feels familiar to any adventurer. There’s a quiet village full of the usual eccentrics and a passel of rough-and-tumble monsters by the beach. It’s all like Hyrule but askew. 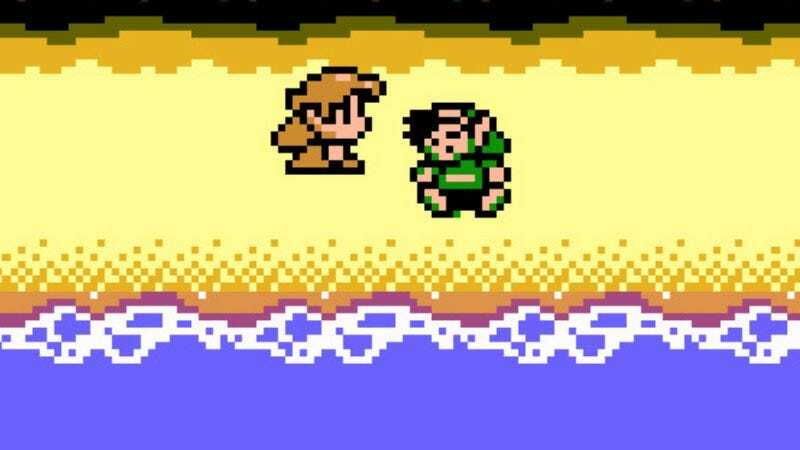 When Link picks up his sword down on the beach, though, that’s when things start to get weirder. A giant horned owl flies in and tells Link that the only way he’s leaving this island is to wake the Wind Fish. He’ll explain a bit more if Link meets the owl later, up north. I can imagine the boredom of Link’s friends when he recaps this one the next day. “Seriously, man, it was crazy. I woke up on this beach, right? And this chick was taking care of me in a town that looked like home but, like, not home? And a talking owl told me to wake the Wind Fish! What do you think it means, bro?” In the game, there’s no stopping to think about what it all means. Link has no grand reason to follow the owl or to wake up the fish—it’s not the Virtuous Thing To Do, just a possible route off the island. As in the haze of sleep, the only choice is to go forward despite a dearth of logic. That’s how Link’s tour of Koholint goes, with one non sequitur piling on the next. The Wind Fish sleeps in a giant egg on top of a mountain. You wake him by collecting eight instruments and playing a sad song for lonely animals. To get one of those instruments, you rescue a dog that eats indestructible plants. Koholint is devoid of the internal logic that fuels the typical fantasy. Instead, this quest is fueled by momentum. Every time Link’s tasks seem so illogical that a conscious person would stop and ask what the heck’s going on—am I dreaming?—the owl reappears to push you forward. Since it’s so easy to get swept up in this push, it takes a while to realize that Link’s actions aren’t necessarily good. The townspeople were just fine without Link (except for the occasional dognapping). The monsters who guard the musical instruments aren’t causing problems for anyone. Link is the one storming into their homes, breaking their things, and taking away their drums and violins. The big guards waiting at the end of each labyrinth aren’t sympathetic to his “conquests,” either. They’re grotesque, and their warnings are unsettling. “You don’t seem to know what kind of island this is,” says a giant worm hiding inside a dungeon wall. “If the Wind Fish wakes up, everything on this island will be gone forever! And I do mean everything,” sneers a face that emerges from a floor. Later, when Link finds a mural depicting what looks like a giant whale and his owl guide, it appears to confirm what the monsters are hinting at: Koholint only exists in the mind of the Wind Fish. Not only is your quest ethically questionable, it’s possibly life-threatening as well. The best-case scenario is that waking up the Wind Fish could leave you stranded in the middle of the ocean. Worst: You’re part of the dream too. But you have no choice. The only thing to do in the game is to keep going, gather the instruments, stand before the egg, and play the “Ballad Of The Wind Fish.” There’s comfort in that surrender to fate. Dreams end, and if it’s not a dream, everything ends eventually. Even if he were back in Hyrule, bored to tears by saving princesses, Link would still have to deal with the fact that he’s going to die. Link’s Awakening turns into a game about putting one foot in front of the other after becoming truly aware of that inevitable doom. Such a fatalistic march may not have the noble sheen of saving the world, but it’s a more universal experience. In typically odd fashion, the Wind Fish’s egg doesn’t hatch a giant magic fish when Link finally plays the song. Inside is one more maze, which hides one more monster, a cancerous mass that changes shape as you fight. When you strike the killing blow, your foe explains who was guarding the instruments: They were nightmares that didn’t want to die. Maybe Koholint will disappear when the Wind Fish wakes up, maybe it won’t. It’s too late in any case. Link has awoken the Wind Fish, a winged whale covered in diamonds and Persian carpets. The owl is part of the fish’s soul. Of course it is. Why not? When the fish fell asleep, he dreamed of this world and was trapped in an egg. He asks Link to wake up with him. The best-case scenario comes to pass. Link stirs from his dream in the ocean, surrounded by the wreck of his ship. He looks up and sees a cloud pass over the sun, or maybe a giant whale covered in rugs. Did it really happen? Is Link still a hero if he killed all those monsters who were just trying to stay alive? What did it all mean? Who’s to say? Dreams don’t make sense. They’re forces of nature, beyond our control. They’re human, and by that measure alone, Link’s Awakening transcends its staid fantasy roots. Whether the game is Link’s dream or the Wind Fish’s, they both face something that many of us confront every morning when we emerge from our dreams into another, supposedly more meaningful reality.